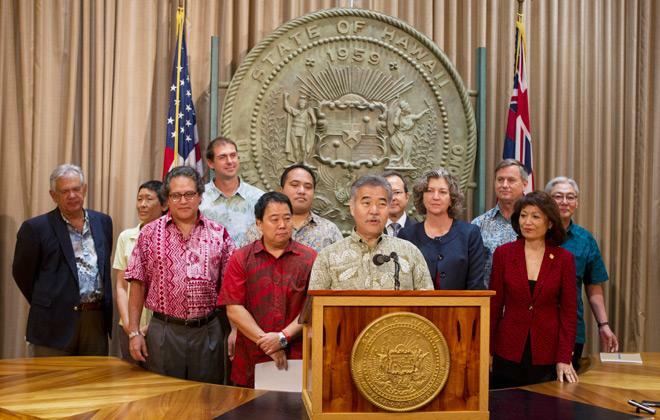 Honolulu – Governor David Ige along with both House and Senate leadership, and City and County of Honolulu officials announced an agreeable deal financing the Turtle Bay Resort Conservation easement. Community representation included The Trust for Public Lands, the North Shore Community Land Trust as well as Turtle Bay Resort with all parties collectively committed to reaching a deal. “Through this on-going collaborative effort made by all parties focused on what was best for Kawela Bay to Kahuku Point shows that we can reach solutions with balance of interests and responsibilities. I am proud of the leadership executed in this plan and am grateful for my community to come away with a win-win solution that includes our Kahuku High School athletes,” stated Rep. Feki Pouha House District 47. While SB 284 SD2 HD2 still needs to reconvene for a vote May 1, 2015 at 3:00pm, Rep. Pouha remains optimistic of the future preservation of the Turtle Bay Easement after today’s renegotiations.